The Oppo A7X comes with a price tag of CNY 2,099 which roughly translates to approximately Rs 20,000. It has been listed on the Oppo’s Chinese website. The deliveries of the smartphone will start from 14 September 2018 at 10 AM CST. The customers can choose from Star Purple and Ice Flame Blue color options. As a part of launch offers, The Oppo A7X has been bundled with Oppo MH133 original headphones as well as 3 months EMI options without payment of processing fees. The Oppo A7X boasts a 6.3-inch waterdrop display notch which offers 90.8 percent screen-to-body ratio and 19.5:9 aspect ratio. The smartphone runs on Android 8.1 Oreo- out-of-the-box layered with Color OS 5.2. Under the hood, there is an octa-core MediaTek Helio P60 processor clocked at 2.0GHz. For storing content, the company has offered 4GB of RAM and 128GB internal storage. The dual rear cameras are positioned horizontally in the Oppo A7X. It features 16-megapixel primary sensor and 2- megapixel secondary sensor. Up front, the smartphone gets an 8-megapixel selfie snapper bundled with AI-powered features in the front and rear panel. The Color OS 5.2 or User Interface (UI) comes with unique features such as do not disturb mode, an AI-powered capability that allow the users to scan the business cards and documents. It also has a smart sidebar that we have previously seen on the on the Oppo F9 Pro. 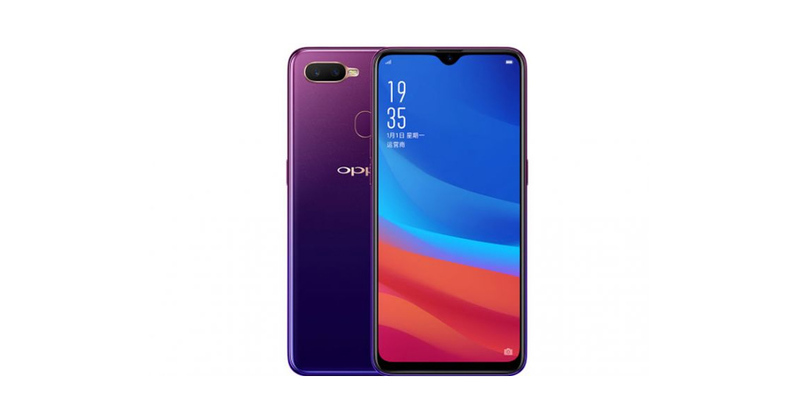 From the specs and design, the handset seems to be the Chinese variant of the Oppo F9 Pro that was launched in India at Rs 23,990. When the device was launched in India, it was also launched in Sunrise Red color option as well. In India, the Oppo F9 Pro comes in a 6GB RAM + 128GB internal storage variant. Under the hood, the Oppo A7X is powered by a 4230 mAh battery. The dimensions and weight of the smartphone are 156.7x74x7.99mm and weigh 169 grams. One must note that the Oppo A7X is currently launched only in the China market, as of now the company has not announced when it would in unveil it in other markets including India.